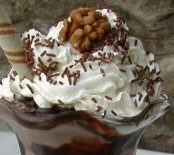 Try this classic chocolate ice cream recipe using real chocolate and rich cream. Click on the photo for the recipe page. Method: Place the milk and sugar into a saucepan and heat gently, dissolving the sugar. Place the milk to one side to cool and when cold, stir in the cream. Transfer the complete mixture into an ice cream maker and freeze following the manufacturer's instructions BUT remember to add the grated chocolate as the ice cream begins to thicken. If you like chocolate chocolate chip ice cream AND chocolate chip cookies, then you can make some fabulous ice cream sandwiches at home. A great dessert treat for occasions like Halloween or a birthday party. In fact, for Halloween mint choc chip ice cream is a great idea - kids just love the 'ghoulish' green color. Discover more ideas for Halloween ice cream on my page here.